Whenever people asks me, what is one place I want to visit in my life time, I always answered them that it should be Lhasa- you bet the kingly feeling as you sit at the top of the roof of the World and you feel like the whole creation is just flourishing right underneath it. As unique as our culture, our architecture has also been the one of the most unique identities we have. It stands out so much, not just superficially and theoretically, but also in its practicability of usage. These dzongs, otherwise known as fortresses are the living monuments which just do not embody our long run of history events, but are the direct answer to how sustainable our architecture is without forgetting how beautiful and glorious they over look the valleys that which flourishes beneath them. In the past, they served as the capital place of protection and the sit to the head of the valley. The piousness has now increased to these fortresses being used as not just administration offices to the direct representatives of our noble king, but it is also the place for young monks to get educated, it has become nothing less than an abode of the religion of which we are all the ardent followers. 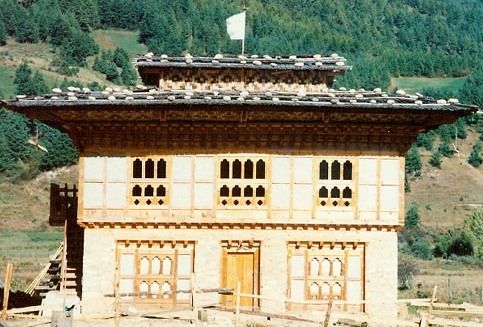 Do we need any other evidence of sustainability of Bhutanese architecture then? And even our house, the traditional houses are closely built to be sustainable and they house ultimate sustainability. The idea of sustainability is still a luxuries term in the world of architecture. Architects still see it as some fashionable subject at the moment. There is another indifferent approach towards making architecture environmental friendly and that’s making it Green. The challenge is that while sustainable architecture can be green, it’s never the same when we reverse the equation. The greenest buildings which rotates, and adjusts it orientation with conditions of climate, and dweller’s choice can never be sustainable if it costs more money and if the embodied energy into its production can be can never be acquired at the equal rate at which it is used. Sustainability takes into an account of conserving while it serves and saving while we can use it. It goes with idea of using what we can produce, thereby keeping future intact and if possible creating more for the future generation of ours. Most of the traditional architecture is sustainable to certain extent or more. They embody the idea of long sustainability and true vernacularism through usage of locally available materials and techniques which tell many stories of our culturist approach in design. Our farm house have withstood the force of nature, our bridges do not just carry the exquisite details of painting and intricate elements, our temples aren’t merely guarding the beliefs of our sect, they also have evolved so much and politically upheld the sacred architecture of ours not to mention how these architectures, even if it’s a small farmhouse, it’s built with strict accordance to orientation of sunlight, wind and the our ever long superstitions. Mud and the wood are perhaps the most eco-friendly materials to build the houses. They not only are pollution free, but also cheap and reliable resources. The mud mortars, stone boulders carved manually, hand planed wooden members, and above all the nail-less architecture makes nothing but a very inexpensive sustainable houses. We don’t have just the sustainable buildings but we also have the luxury to do it almost cheaply. Bhutanese architectures, traditionally, we never used metal nails to fix our doors or windows. The doors even these days in rural areas, they either hang on something or they rest on a hole with an extra wooden member. Such hinging techniques prove so much of our beautifully expressed architecture, not to mention how our huge dzongs are also jointed by such delicate (or durable) piece of technique. They are innovative as well. The sliding on windows also do not use any other mechanized channels. The window sills are low so that it fits our way of sitting on the floor. Even on the shingles on the roof, these were held by the stones on them (because of which we normally had the low sloping roof which was not possible though in southern foothills where rainfall was extreme). The cornices are perhaps one of the most beautiful combination on our buildings, these cornices carry so much a load of trusses over them due to free nature of movement and agility. These are also responsible for distributing the strong wind forces and earthquake forces equally throughout the building skeleton. Perhaps one drawback our traditional farmhouse has is sanitation. Of course, it serve protecting domestic animals from dangerous predators, but it is so much a hazard to the sanitation with cows and pigs shedding right under the floor where we sleeps. Now the era of concrete and steel has majorly dominated the market. The new techniques have conquered over the traditional due to easy and fast construction. The time when whole villagers gather and start building a house is way over except in few rural areas. Even to the facades which used to have a wonderfully crafted ekras made out of wooden frames with beaten bamboo pieces fixed over it with mud, we have concrete facades faking such details with falsifying paintings or with an elevated line of cement plasters. Wooden shingles are very much out of sight with iron sheets proving sturdier. Window sills have been raised to a meter or less, it doesn’t really allow the usage of natural light to a monk who is reading our religious sects by sitting on the floors. Well, as for the materials’ adverse affect to environment around, one can possibly be a witness to how harmful waste cement mixtures are to the vegetation and the soil. However with certain innovation, use of such materials are also considered sustainable though. Our country needs infrastructures in almost every field to usher a new era of development, and we need builders and architects at larger scale to play a pivotal role. It is no mystery that tomorrow when we would have our country built using the same materials and techniques like others in the world do, we would by then think of innovating the global ideas of keeping buildings and spaces sustainable. It would be blessing if we would have not lost the real originality of our architecture then. Of course going by the norms and by-laws of our City Corporations, there’s so much a restriction on architect even trying to change the facade design of our architecture. It might restrict the innovation of architects though, but there can always be more fascinating and beautiful way to cross the river if not by a bridge. It can evolve, though, in a way it doesn’t deviate from the way it is and it upholds the same value and uniqueness. It’s a challenge to keep our traditional architecture sustainable, beautiful and sacred. P.S: This article is published in The Asia Magazine..